Cass Calloway just wants to be a successful geneticist, until she’s unwittingly mutated by her self-proclaimed arch-nemesis Morty Montovarius. Now she has to find a way to become human again while dealing with the egomaniac who transformed her, her bouncy half-squirrel brother, her prospective boyfriend slowly changing into a salamander, and a twenty-foot were-poodle! If you enjoy stories about people turning into inhuman critters and dealing with the consequences, or if you want to bear witness to the inevitable consequences of almost totally unregulated mad science, consider giving UTC a spin! 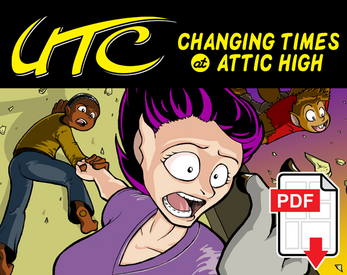 This 97-page PDF collects Chapters 1-4 of the webcomic UTC, from "Changing Times at Attic High" to "Day of the Dork."